PLAINVILLE - As Plainville girls basketball head coach Jessica Neuweiler stood in the locker room with seniors Caitlin Barker and Sam Lozefski after the team’s 62-52 win against West Haven on Senior Night, she wanted to celebrate the end with her upcoming graduates by going back to the beginning. The seniors’ importance to the Blue Devils on the floor was front and center on Saturday evening, as the duo combined for 33 points to lead Plainville to its 12th win of the season as it continues to build momentum heading into states. Before the postseason arrives, Saturday served as a night to acknowledge Barker and Lozefski, who have helped build the program back up alongside Neuweiler over the past three seasons. The escalation was gradual, but for two of the pillars of the rebuild that will be moving on after this season, the time flew by. Lozefski and Barker flew by West Haven on Saturday, combining for four 3-pointers and building a double-digit lead before coming out in the final minute to a rousing ovation from the crowd. The two shared a hug at the end of the bench and wondered just where the time went. 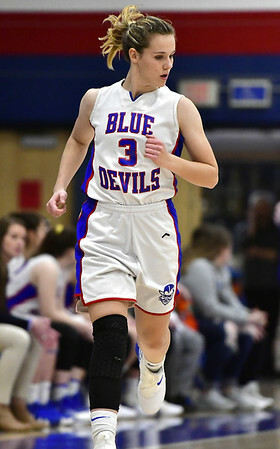 Barker’s time as a high school basketball player may have gone too fast for her liking, but the memories of her time as a Blue Devil will officially last forever, as the next time she returns to the Plainville gym could be the time she sees her name stitched on the blue banner that lists the members of the school’s 1,000 point club, an accomplishment she secured last month. For the Plainville students and fans, their lasting images of Barker and Losefski likely mirror the portraits that were hung in their honor on senior night, tall photos behind the basket showing each senior going up for one of many points that were recorded over a successful career. For Neuweiler, her memories of the two seniors she considers among the most athletic players she’s ever coached are the moments that nobody else saw but her and the team. Posted in New Britain Herald, Plainville on Sunday, 10 February 2019 21:51. Updated: Sunday, 10 February 2019 21:53.